This Cubs fan has a great ability to put you at ease in his presence. Chad’s passion for health and fitness and words of encouragement will keep you coming back! 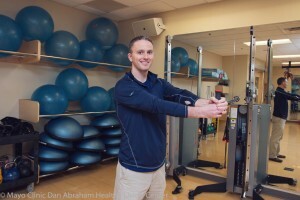 Chad couldn’t be happier in his professional life than to be working with people of all ages, abilities, and levels in their fitness journeys. Outside of work, Chad enjoys running, cheering for his favorite sports teams, and spending time with his wife and two adorable daughters. You can find Chad teaching in the training studio or find him during floor coverage and can ask him questions about running.